Barnier will meet with Britain's Brexit minister Stephen Barclay this week. “We can find guarantees to confirm, clarify, guarantee the goodwill and good faith of the Europeans with commitments which would have real legal force,” Barnier said in comments published in several European newspapers including Die Welt in Germany and Les Echos in France. 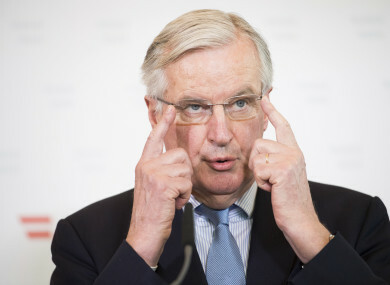 Barnier also suggested European leaders would be amenable to a short “technical” delay in Britain’s departure from the EU, scheduled for 29 March, to give the British parliament time to formally ratify a final divorce deal. With the Irish backstop being the biggest obstacle to agreement in parliament, Barnier said there was “misunderstanding” over the proposed backstop deal. “Limiting it in time or introducing a unilateral exit clause would call into question its credibility,” the EU’s top Brexit negotiator insisted. The backstop “will end either when we have a global agreement on the future relationship, or a specific agreement with Ireland,” he said, assuring it “was never the wish” to bind Britain to European trade rules indefinitely. Barnier said he would meet Britain’s Brexit minister Stephen Barclay and Attorney General Geoffrey Cox next week to discuss options. “There is a way that the British (parliament) could vote, between now and March 12th, with these guarantees of our good faith, It will be up to them to fulfil their responsibilities,” Barnier said. It is on course to leave without an agreement after British MPs in January overwhelmingly rejected the divorce deal May struck with the EU late last year. The embattled leader is now seeking changes to the pact which she hopes will be enough to get it through parliament by 12 March 12. “The European institutions will do whatever is necessary on their side but the British have told us in the past that they will need two months to ratify” the deal. While Britain is yet to request a delay, “I don’t think there would be any objections in principle” from the other 27 EU nations, Barnier said. Email “Michel Barnier says EU is open to negotiating on Brexit 'guarantees' but not on the backstop”. Feedback on “Michel Barnier says EU is open to negotiating on Brexit 'guarantees' but not on the backstop”.